Which Way Will The Cloud Blow In 2014? I have spoken or shall I say written a lot about the practical side of adopting cloud technology. I decided to take a break from this practice and delve on the future of cloud in 2014 and what will drive this phenomenon. Everyone is trying to be a Facebook. I am not talking about small guys but even big players like Microsoft, IBM and cronies are looking for acquisition in this space. Not that Facebook is raking in the money – it’s not. But the attraction for this big companies is not the money they would make from it but to stitch their numerous offerings together with the thread of social interaction. Obviously this can only happen along with the growth of cloud technology. Therefore I would predict that Social platforms will blow the Cloud quite strongly. According to an IDC report for 2013, the digitized world would be around 4ZB in size, which they claim is an understatement. Digital Data capture and storage has seen phenomenal growth in the past few years. Not only is the volume of data humongous but the technology to analyze data is galloping at a tremendous speed. Online marketing is shifting towards discovering and predicting future trends which means crunching data at an extremely high rate. All this would require huge cloud infrastructure because traditional storage would cost exorbitantly. Big data therefore directly correlates with the size of Cloud infrastructure. Big data would bring in better efficiency in cloud management and related technologies. Software as a service has seen dramatic advances in 2013. End users and commercial enterprises have realized the advantages consuming software as a service rather than as a product. I will not go into the details of SaaS but only emphasize the fact that SaaS to be successfully implemented requires robust infrastructure and the cloud is perfectly suited to meet these requirements. Numerous reports suggest that big SaaS players would acquire an existing Cloud infrastructure vendor or develop their own. Either way the total size of the cloud would expand to support various SaaS offerings. More and more traditional games platforms are moving into the cloud. Games are consuming higher amount of memory, both for storage and for rapid deployment. Massively multi-player online games require enormous amount of storage and this thirst can only be fulfilled by adding to the available cloud infrastructure. With all of these in mind the gaming industry should consider a Cloud vendor that can flexibly expand and contract their system configuration. GMO Cloud America, Inc offers such game server which is also capable in handling sudden heavy traffic. The online animation industry has till now been in the shadows. Development and distribution of animation sequences requires high capacity and high speed networks which were hitherto not available. The technology related to cloud infrastructure including network is becoming sophisticated and likely to support delivery of animation products at high speed. I can come up with many more products and services which directly impact on the growth of Cloud infrastructure. The ones I have mentioned are likely to have a greater impact on IaaS. Software as a service is gaining ground due to several reasons. The most important is the ‘pay as you use’ model. The variety of SaaS providers is mind boggling. I recently saw a SaaS operator provide conversion of audio files into forty different formats. Imagine how many software packages you will have to buy if you want such an extensive repertoire of audio formats. Another SaaS provider gives a complete sound studio online with loops, aural effects and virtual instruments like drums, violin, guitar and others. They also provide online storage space. This is a fascinating service, if you look at the expense and time involved in actually hiring a studio to compose your music. These are only a couple of examples which show the power and range of SaaS. The other aspect of SaaS is the flexibility which a cloud provides in extending these facilities. Why must SaaS providers go for IaaS as their ideal infrastructure? There is a misconception that SaaS is part of cloud nomenclature. SaaS need not always be based in a cloud. SaaS services can as well be provided from traditional hardware and infrastructure. But certainly SaaS model is made for hosting in a cloud. Rather than spend money on idle infrastructure, it’s advisable for SaaS providers to embrace the cloud. These operators must be able to adjust or regulate their infrastructure with increase or decrease in traffic to maximize their profit. Enterprise software is moving to the SaaS model and these providers can optimize their expenses by moving to the cloud. For SaaS startups, cloud is a boon. They can launch their services with least initial expenditure and scale up as their services pickup. Typically, SaaS providers have to wait for a year or more to reach maturity and gather momentum. They often experience a sudden surge in traffic which cannot be estimated in advance. The cloud infrastructure can quickly scale up to meet such a surge in traffic. In the interim, they need not pay for idle infrastructure. In my opinion delivery is critical for any SaaS provider. By this I mean that the services must be reliable and the software delivery must be efficient and effective. Every transaction in a SaaS model is unique and must be completed optimally. For this the infrastructure, platform and the software must work efficiently. There can be no compromise here. The cloud provides a robust environment which meets the exacting demands of SaaS. A powerful environment is imperative in running a business smoothly. GMO Cloud America’s free Load Balancer functionality is guaranteed to help you build that reliable platform while saving on costs. There are innumerable kinds of SaaS offerings. Some are memory intensive while others require high computational speed and complexity. In case of a cloud we talk of server instances which means flexibility in choosing our configuration depending on requirement. It is this flexibility which is the most attractive feature of cloud. Selecting the right server instances can be achieved with ease when we are based in a cloud. In a traditional data center environment this would be impossible. SaaS providers must embrace the cloud, especially startups. The two have a symbiotic relationship and provide for better efficiency. While sports is one of the biggest businesses in the world, online gaming dwarfs it in comparison. According to online news portal Newzoo, the global games market will grow to $86.1 bn in 2016. This is a huge opportunity for online gaming companies and entrepreneurs, although though there are some constraints and challenges in growing a gaming portal. But many of these can be resolved with the use of cloud computing. Traditionally scaling has been a major hurdle in promoting a gaming portal. Engaging many servers in advance meant heavy investments which a start-up typically could not afford. Server crashes and poor reliability were common. The fickle nature of gaming audiences also means that one can never predict the success or failure of a gaming venture. In fact, the success rate for gaming portals is poor overall. In such a situation, it’s not financially feasible to invest heavily in infrastructure. This is where cloud computing technology comes in. It is quite simple and easy to scale up in a cloud environment. An entrepreneur can start with the most basic services, and after gauging the response can scale up as required. This has enabled many start-ups to venture out on their own. Massively Multiplayer Online gaming can consume an extraordinary amount of resources. These games can build up quickly with players participating from around the globe. This means the speed of access to the website has to be uniformly fast. This can be facilitated with the use of cloud computing. In contrast, it would have been very difficult with traditional infrastructure. This is perhaps an important reason why start-ups should opt for cloud services right from the beginning. MMO games are becoming quite popular these days. This demand has pushed up the need for bigger and more complex software. Such software uses multithreading and other techniques which in turn work well in a multiprocessor environment. All these features are readily available in a cloud computing environment. This is explained in GMO Cloud’s Game Server Configuration illustration. This is an issue which can confound even the best of technical staff. Gaming portals encounter high fluctuations in traffic, depending mainly on the time of day. Gearing up for the peak traffic load necessitates careful planning. 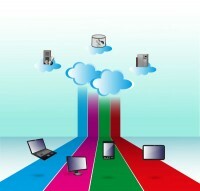 Adding resources with increasing demand can easily be accomplished with cloud computing tools. Games are played on mobiles, smartphones, tablets, laptops and desktop computers. Online gaming software must be able to accommodate all these platforms. The design of gaming software must be robust and flexible. These features work well with cloud computing technology. The gaming industry is growing at a fast pace. The opportunities are huge, but it requires better technology to handle such a complex environment. Cloud computing infrastructure not only offers better resources but also allows for seamless scaling. It would not be innaccurate to say that cloud technology has come to the rescue of gaming start-ups. The ever-growing demand for cloud gaming is making more and more game developers turn to cloud computing. Recent research and analysis offered by multiple companies on cloud computing trends indicates rapid growth of this technology. The increasing popularity of cloud gaming has raised a few questions: Is this cloud-based gaming segment a threat to the future of video gaming consoles? Speculations are on the rise because every game hardware manufacturing company is getting closer to becoming a cloud-based gaming company. The recent acquisition of Gaikai by Sony is an example of this new trend. Microsoft has been keen to take over OnLive cloud gaming company. However, this acquisition still remains in the rumor stage. Under such conditions, we’re very curious to know what lies ahead in for the industry. Sony’s acquisition of Gaikai creates an entirely new scenario in the gaming industry. In a traditional gaming setup, hardware consoles like the Sony PSP are powered with high-end GPUs to offer seamless entertainment for gaming lovers. While the initial cost of the hardware is not expensive, the purchase of games and licenses increases your overall expenditure. The entrance of cloud computing technology into the gaming segment has changed hardware configurations. Companies like OnLive and Gaikai are able to host powerful GPU resources in the cloud to offer seamless entertainment to users. Another concern for the gaming console market is the entrance of high-end mobile gadgets into the gaming arena. Android and iOS games are becoming increasingly popular. Amid this fierce competition, gaming consoles have to come up with innovative features. To stay in the competition, consoles are turning into media centers and entertainment boxes. Netflix Applications and Xbox Music are some examples of this changing trend. Though this is a good marketing strategy by gaming hardware manufacturers, competing against cloud technology is not easy. While cloud-based gaming services offer seamless entertainment, not every gamer has a high-speed internet connection. To overcome this challenge, gaming companies are coming up with new business models that combine the power of gaming consoles with the scalability of the cloud computing network. Free to Play (F2P) is a new model in the gaming segment. There are no subscriptions or monthly charges. These companies make money when users purchase additional features to facilitate an enticing gaming experience. Whatever the business model, one thing is for sure: Gaming consoles will be missing their high-end hardware, and cloud-based gaming is going to dominate the gaming industry very soon. It is a win-win situation for game developers as well as users. While game developers get the flexibility to incorporate innovation into games, users enjoy cost-effective plans. Every gaming company needs to adapt to changing trends to stay in the competition. Presently, there is no threat to the video gaming console market. However, with more and more game developers turning to the cloud, the future for hardware consoles looks bleak. How Progressive is the Gaming Industry When it Comes to the Cloud? While cloud computing has revolutionized the IT segment as a whole, the gaming industry specifically has reaped enormous benefits from innovative cloud technology. High scalability and low latency are the two important requirements for gaming. As the cloud offers highly scalable solutions with lower levels of latency, the gaming industry has quickly embraced this innovation, and the future of the sector definitely lies in the cloud. The most recent E3 Expo, which would normally showcase innovation in gaming hardware, ended up offering nothing significant to gamers. The absence of new consoles underscores that the industry is looking at fully utilizing the resources of the cloud. Also significant in the cloud gaming segment is the acquisition of Gaikai by Sony. Gaikai has been a pioneer in the cloud gaming, and the acquisition will allow Sony to tap into that as well. Another key player is Microsoft. And to add cloud-based power to its Xbox infrastructure, the company is recruiting some of the former staff of OnLive, one of the leading companies that made cloud gaming a reality. After Sony’s acquisition of Gaikai, many people felt that Microsoft would counter by acquiring OnLive and adding its services to its Xbox 720. However, this acquisition did not materialize. There are several advantages of cloud-based gaming services. For instance, competitive prices offered by the OnLive cloud gaming site enable users to enjoy amazing games. Users need not download 10GB of data before playing a game, but can simple save the game and access it again from another computer. They can buy daily passes or monthly subscriptions to play hundreds of titles. The automatic scaling feature augmented with low latency makes cloud games the ultimate choice for gaming lovers. All this is not possible with a traditional gaming setup. Current gaming infrastructure is not efficient enough to provide a rich gaming experience to users. However, gaming technology is changing gears. The new GeForce grid processor from Nvidia is specifically designed to improve the performance of cloud games. It combines the power of GPU virtualization and low-latency to provide the best platform for game developers. Another important concern for the cloud gaming sector is speed. Every gamer does not have the required high speed broadband network to enjoy live streaming of audio and video. However rapid advancement in telecommunication is sure to deliver high speed internet connections to everyone soon. On the developer’s end – pertinent to scalability and low-latency features – they will need a reliable infrastructure partner, especially in key areas like security, fault tolerance, and support. To gain a better idea of these concepts, check out GMO Cloud’s High Availability Features section. The amazing benefits of cloud computing technologies offer a perfect platform for game developers to unleash their creativity. With changing technologies, it is important to stay ahead of the competition. Cloud-based gaming services are definitely the future of the gaming industry.